Over the Christmas break we traveled up to northern Ontario and, as always, I took some drones along for the festivities. While we were enjoying the holidays the temperature dropped as low -36C and I actually flew in temperatures as low as -29C. I would like to point out that these flights were not for commercial purposes and they all took place on a secure, privately owned rural property 15km from town (AKA – the middle of nowhere). Our company operations manual forbids commercial flights below manufacturer’s specifications and these temperatures were WAY below those ratings (the DJI Mavic is rated to 0°C and the Inspire 2 -20°C). These flights were for recreational and educational purposes only! Why would I choose to fly in this extreme cold and possibly risk valuable hardware? From time to time I like to test our procedures and our gear outside of the normal operating range. This was the perfect environment to get some good learning in where none of the normal pressures of a commercial shoot and I was far away from controlled airspace, other people’s property and any public which is a rare thing back home in southern Ontario. It was also a great excuse to get outside and escape the Christmas treats for a little while. Also, this may sound a bit sacrilegious but since purchasing DJI Care on all our DJI units I find it easier to take a few calculated risks during experimental flights in order to learn and increase our safety on our commercial operations. How did my small fleet of Christmas drones fare in this extreme cold? Surprisingly well actually. I only flew the Inspire 2 and the Mavic Pro and they both functioned perfectly at close to -30°C. I was expecting the Inspire 2 to do well as we have already used in during a number of cold weather commercial operations (-20°C) as it is designed and certified for that environment with built in battery warmers and more redundant systems. It was the Mavic that was the real surprise to me. It didn’t seem to be affected the cold at all even flying in a biting wind and snow at half a kilometer distance. Wow! Flight times were affected but not by much. Maybe 10% less battery life was all that I noted on either machine. Frozen fingers limited my flight time much more than batteries and the iPads gave up long before that. My new iPhone 8 put up with the cold the best on the monitor side of things. I was sad that I had not packed one of our new controller hand warmers for this trip as that piece of gear would have kept me in the air longer and a lot more comfortable for sure. -Fly within the technical limitations of your hardware or else you risk machine failure and potential safety hazards. 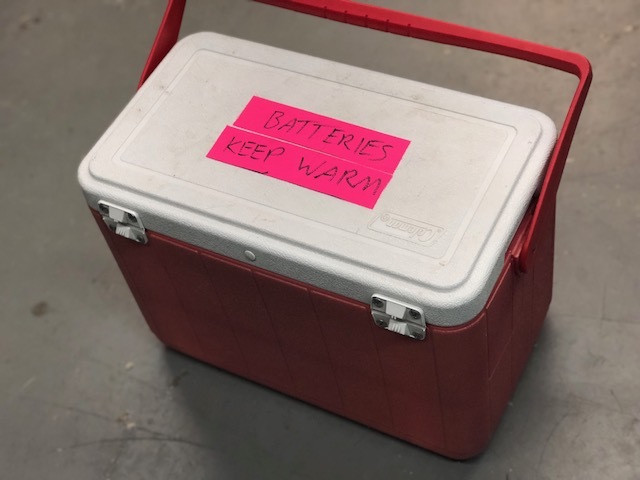 -Keep your batteries warm! We keep ours in an insulated cooler in a running, warm vehicle until needed. If we take spare batteries with us outside they are in inside pockets close to body heat. -Don’t “shock cool” the drones prior to flight in extreme cold. This point sounds counterintuitive but we actually transport our drones in the back of the truck in closed cases so that they slowly drop down to the outside ambient temperature prior to flight. Drones utilize complex internal sensors and these need to “acclimatize” to the operating environment prior to use in order to function properly. If we were to take a warm drone from inside to outside where there was a large difference in temperature we would be much more likely to get sensor errors and other potential problems. Batteries, controllers and iPads like to stay warm but not the drones! 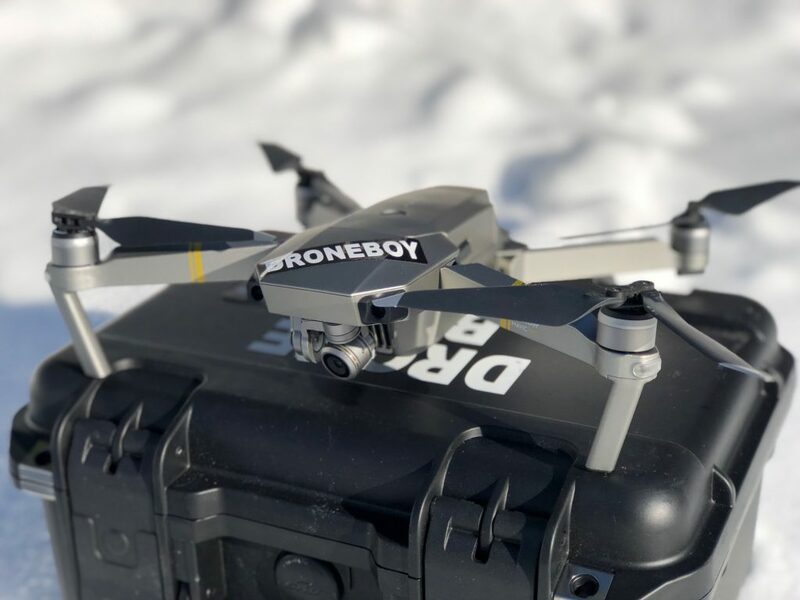 -Don’t take the drones or cameras directly into to a warm after operating outside in the extreme cold until you are all done shooting for the day. The lens surfaces will get covered with condensation and remain unusable for a long time and this moisture is certainly not healthy. A better technique for transiting from warm to cold and vice versa is to keep your drones and cameras IN their cases and let it all acclimatize more slowly. This slower temperature transition puts much less stress on the components and eases possible condensation issues. As a bonus the case can also provide a snow free launch site! -Depending on the design, make and model of drone some additional environmental protection may be required on the drone itself. This may include custom covers and even battery covers and/or heaters. -Use hardware and systems that are rated for the cold. The new DJI Inspire 2 is an amazing cold weather performer. When it is -20C our old Inspire 1 units wouldn’t even fly as they generated a cold weather warning which locks the user out from launching (for good reason). This is not an issue with the self-warming Inspire 2 batteries. The iPads that we often use as monitors in our work are completely useless in the extreme cold usually shutting down in a few minutes (not good). We have now switched to the new DJI Crystalsky monitors which, again are rated to -20C. -Wear appropriate clothing. Piloting drones is NOT an extremely active pursuit and standing still in the cold is a great way to get really cold fast. When you get cold you get stupid and everything goes down from there (drones included). Wear more clothing than you think you need and don’t cheap out. Buy proper mountain gear and learn how to layer your clothing like a real mountaineer. I will often fly with a balaclava, goggles and many layers of high quality thermal clothing. Another great tip for winter operations is to travel with a small piece of closed cell foam like a camping sleep pad and stand on that so that your feet don’t freeze. This small piece of foam will be enough to insulate your feet and keep you much more comfortable. -Protect your most valuable and vulnerable flight instrument – your fingers! Successful winter drone operations require that you find good gloves that you can still fly with. I like these specialized winter photographer gloves with detachable finger and thumb tips for more precise operations when needed. I have also taught myself to fly certain less precision based missions with thin gloves on. I also always have a pair of huge mitts with chemical hand warmers inside to heat frozen fingers between flights. Keep your fingers warm as they are a critical to comfort and general flight control and quality results! 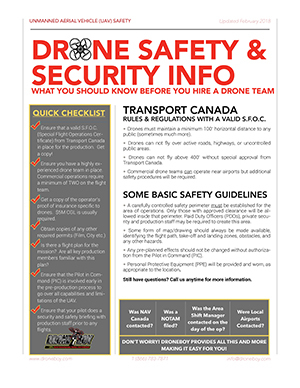 -Fly from as protected an area that you can find while still maintaining good line of site to the drone in flight at all times. 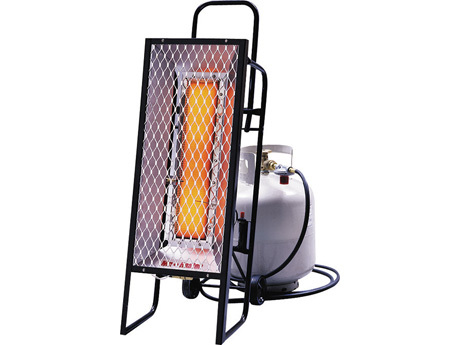 We will often set up a portable propane radiant heater right next to where we are operating from in order to take some of the edge off the temperature as well. -Keep the vehicle running and warm OR have an appropriate warm up room nearby. We have a drone trailer that comes on all winter missions and inside we have an electric heater as well as a table and chairs for the comfort of the team. 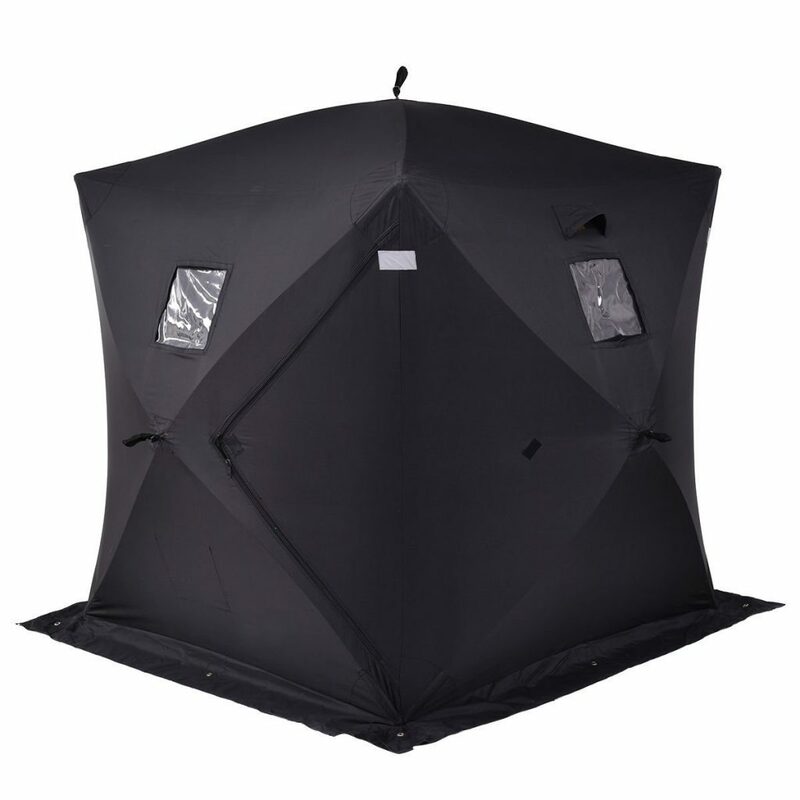 When we cannot take the trailer along we have utilized a portable ice fishing tent for this purpose. -Do not charge your batteries in the cold. It takes much longer and sometimes, even if your charger claims that your battery is full it is not. Electrons slow down and the complex chemistry of charging Lipo batteries falls apart in cold weather. A couple of years ago we had an incident where one of our heavy lift drones went from 24.6 V (full charge) to 19V (not enough to fly) in less than 20 seconds. No one was hurt but we lost some expensive gear and learned this lesson the hard way. -You must eat more food in the cold! Your body will burn a lot more calories and it is food fuel that will keep you going. On our jobs we always have easy to grab, cold weather friendly high calorie snacks like these Shot Bloks for instant energy (be sure to choose things that you can still chew in the cold). Cold weather operations is a great place to actually eat chocolate and high calorie candy. Be sure to bring hot liquids like coffee, tea and soups in thermoses and plan for warm meal breaks throughout the day. Remember, If you are cold – eat! -If you get cold STOP and warm up before continuing the mission. If you get really cold, stop the mission and re attempt it in warmer conditions. Know the signs of hypothermia and keep a vigilant eye on everyone on the team. Flying in the cold weather can be very rewarding and is absolutely worth the effort. The contrast in light is amazing, ice and frozen waterfalls are beautiful and there are a lot of spectacular shots that other folks just won’t bother capturing because the environment is too difficult and the perceived risks are too high. If you know your equipment and your team’s limitations then anything is possible. Just remember, be a good Boy Scout and “Always Be Prepared”. Don’t let the cold weather stop you. Get out there and fly!